Andrew Mellon made a statement that is in dispute as to its origin. It was found in the writings of Herbert Hoover. 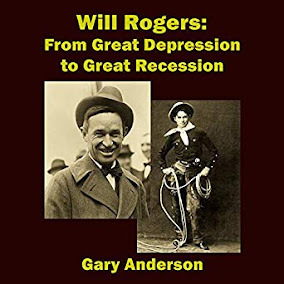 While many say it was not a legitimate expression of Andrew Mellon's opinions, I believe it was the expression of Hoover's understanding of the Federal Reserve Bank and that it applies to our times as well. The famous Mellon “statement” is itself a caricature, made up after the fact by Hoover himself. There is actually no direct evidence that Mellon favored all-out “liquidation.” As an ex-officio member of the FRB, he supported rate cuts. For details see the abstract at Wiley.com. At my age I probably should not eat too much fast food. I try not to. I run my dogs and try to stay healthy. But going into fast food restaurants has definitely been an eye opener lately. I have a few gripes and praises. This is not an exhaustive study, as I included only 10 franchises. For example, I don't cover Five Guys or Smashburger, both tasty but pretty rich. I didn't cover a nice fast food franchise, Chick fil A which will finally locate in Las Vegas. The founder, Mr Cathy, passed on and had a thing against Nevada because of gambling. Las Vegas is a regular place, except for the strip. Well, that is unless you have taken Abilify, which makes some people gamble uncontrollably. I kid you not. There are clouds ahead for real estate worldwide, while it remains a mixed bag. As oil prices soften, it appears to most people, the Fed chairman included, that demand is slowing in the world and that oil is simply a gauge of that decline in demand. So, while there are limited access cities, where tech and growth are strong, and economies that are rising globally, other places are dependent on exports of raw materials. They were high flyers once. They could be the first nations to see real estate price destruction. States in the USA that rely on oil production are likely to see the same unless there is a serious reversal of commodity pricing. Draghi of the ECB, and Germany must have a secret plan to save the Eurozone. One cannot make sense of their actions without contemplating this plan.